Instagram is a powerful visual marketing tool, and a highly engaged audience is something that brands are willing to pay good money for. Studies have shown that Instagram provides brands with 25% more engagement than other social media platforms. What brands are looking for is a good like to follower percentage-- about 10% and engaged commenters who have long-term interest in your feed. For example, not a group of followers you got for #followforfollow. If you've purchased your followers, the engagement will never be what you need. A better way to spend your time (and not money) is figuring out how to position your brand and self so that your engagement is real. There's something to be said for faking it till you make it, but with IG, it's not the case. It doesn't look good to have 50k followers, 36 likes, and 1 comment from your BFF on a post. However, if you have a big, authentic following (congrats! ), there is money to be made. Figuring out what to charge a brand can be tricky, especially when you're just starting out. What they are banking on is targeted marketing that increases brand awareness and leads to sales. Here is a reasonable breakdown of what you can change. Keep in mind, there is no one size fits all model, and price points depend not only on the brand's bank account but also how specifically you're targeting an audience. 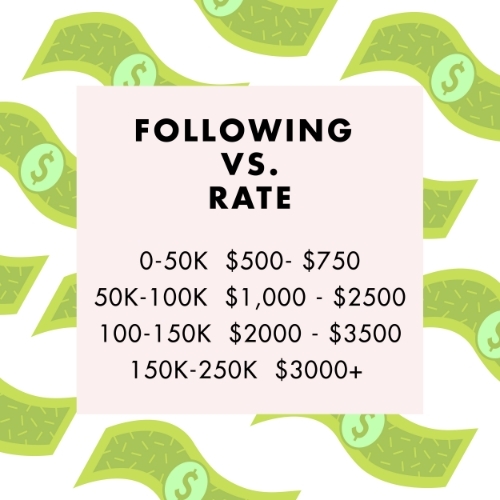 If you are posting for an athletic wear line, and you're a yoga instructor with a high follow count, you might be positioned to charge more. You can also charge more based on case studies and proven ROI driving traffic. This is often done two ways. The first is with a dedicated hashtag created by you and the brand. With websites like Keyhole, you can track how and where the hashtag has been used. Second, if the brand provides you with a dedicated Bit.ly link that you can share in your bio (you'll often see this listed in the IG post as "link in bio") they can track how much traffic you're driving from that link. The more clicks, the more green.